The Shroud of Turin is an enigma to many. Some dismiss it as a medieval forgery, others worship it as a holy relic. Perhaps it should be regarded as neither, but rather as physical evidence of Christianity's central claim: the resurrection of Jesus. If it is someday proven false, it bears no weight on the history of Christ. However, if it is proven authentic, it stands as both a call and an indictment on humanity. It would be proof of the Resurrection. Rather than be very technical, I will simply lay out some old known facts, along with some very recent research. Lastly, I will close with some compelling circumstantial evidence. The Shroud bears an historically accurate image of a crucified man, complete with distortions from wrapping a three-dimensional person. It is no painting or piece of art. One can see his fingernails, as well as his teeth behind his lips. The wounds are consistent not only with crucifixion, but one particularly famous crucified man. The most common view of the Shroud is actually a negative image, making it much like a photograph - a process and technology unknown until the late 1800's. This could only be created by the burst of energy previously hypothesized. The image contains 3-D information, allowing the image to be rendered fully in three-dimensions. NASA has used planetary imagery software to create the rendered face of the man on the Shroud. The blood on the Shroud has been authenticated as actual human blood. The Shroud contains fibers of plants and pollen native only to the Holy Land. Radiation has been found on the Shroud, giving rise to the theory that a powerful burst of light and radiation at the moment of resurrection created the image and photographic negative. The official death certificate has been found written upon it in a faded, fragmented combination script of Greek, Aramaic and Latin, reading "Jesus of Nazareth, [Killed] by order of [T]iberius [Caesar]." Finally, the Shroud has been newly dated, placing its origin in the First Century, the time of Jesus, not the middle ages, as previously thought. It was carbon dated to the middle ages, and. There is no mention of it in the historical record of it until the early middle ages. These would seem enough to settle the issue on the surface, despite any other evidence. It is tantamount to a plain suggestion of forgery. However, given the new research, and a little historical understanding, both of these are easily resolved. The Shroud was burned in a church fire in the medieval era, burning both the Shroud and the chest containing it. Being infused with carbon from the soot, the Shroud would naturally carbon-date to the time of the fire. After the fire, the Shroud was repaired, stitched and restored in the areas it had been burned. Out of a holy sense of protection, the Vatican only allowed samples to the S.T.U.R.P. scientists from the repaired areas, not the original, again resulting in an inevitable dating to the middle ages. Regarding the second retort, one simply needs to understand that before the middle ages, without the systematic copying and recording of Christian monks in monasteries, the historical record on ANY event, object, person, or even kingdom is exceedingly scarce. This is why that time period is commonly referred to as the Dark Ages. Such a silence is not unique to the Shroud, but to nearly anything in reference to this time period. Therefore, even if one would still find the silence suspect, it still falls within the rational scope of reason to accept it as natural for this period. "We can conclude for now that the Shroud image is that of a real human form of a scourged, crucified man. It is not the product of an artist. The blood stains are composed of hemoglobin and also give a positive test for serum albumin. The image is an ongoing mystery and until further chemical studies are made, perhaps by this group of scientists, or perhaps by some scientists in the future, the problem remains unsolved." In summation, what we have is a burial cloth consistent with ancient burial practice that has been dated to the first century, whose origin is in the Holy Land, bearing a radiated image of a crucified man, with a death certificate identifying the person as Jesus of Nazareth in the common languages of the time. Although at the conclusion of the study in 1981, the Shroud could not meet the threshold to be proven by a scientific standard, it seems that in the present day, some 33 years later, we may now have the evidence to conclude as such. John 20:7 says that there was a separate piece of cloth wrapped around his head to what was wrapped around his body. 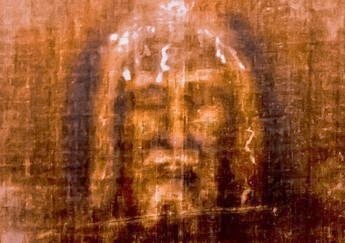 The Turin shroud is once piece of cloth showing body and face, hence it is a fake.